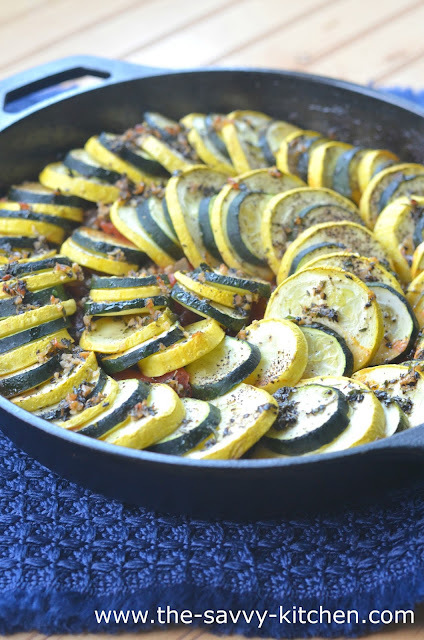 Both of my kids love squash, so roasted zucchini and yellow squash are side dish staples in our house. The other day I was prepping our routine side dish when I decided to spruce things up! Bradley was watching Ratatouille, so I thought, "Why not?" I used ingredients I had on hand (so no eggplant nor tomatoes per traditional recipes), but feel free to add them if you have them! I loved this and can't wait to make it again. The kids gobbled it up, too! Preheat the oven for 375 degrees F.
Slice the zucchini and yellow squash into approximately 1/16-inch rounds, then set aside. Heat 2 tbsp. of olive oil in an 8-inch oven safe pan. Sauté onions, garlic and bell peppers until soft. Season with salt, pepper, and dried basil, then add diced tomatoes. Stir until ingredients are fully incorporated. Turn off the heat and smooth the surface of the sauce with your spatula. 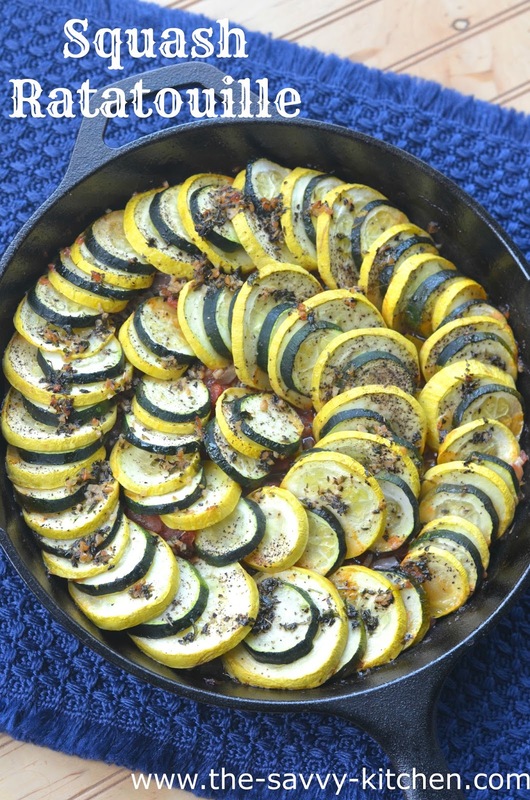 Arrange the sliced veggies in alternating patterns on top of the sauce from the outer edge to the inside of the pan. Season with salt and pepper. Mix herb seasoning ingredients and pour over the vegetables. Cover the pan with aluminum foil and bake for 40 minutes. After 40 minutes, uncover, then bake for an additional 20 minutes. The vegetables should be soft.